So first is Hard Candy's Cocoa Smore ($4, Walmart). It's a creamy mauve-ish base with small matte black and shiny silver glitter. This is the only one that doesn't have only black matte glitter, but I do like the texture that the silver gives. Next up is Deborah Lippmann's Rockin' Robin ($19, Nordstrom). It's a creamy robin's egg blue base with small matte black glitter in it. The glitter seems to be just like that of the Hard Candy, in color, size and shape. Finally there's Illamasqua's Scarce ($17, Sephora). It's a creamy pink base with larger black matte hex glitter and black matte microglitter. This is the only one with two different sizes, and I really love the micro with the hex glitters in this. 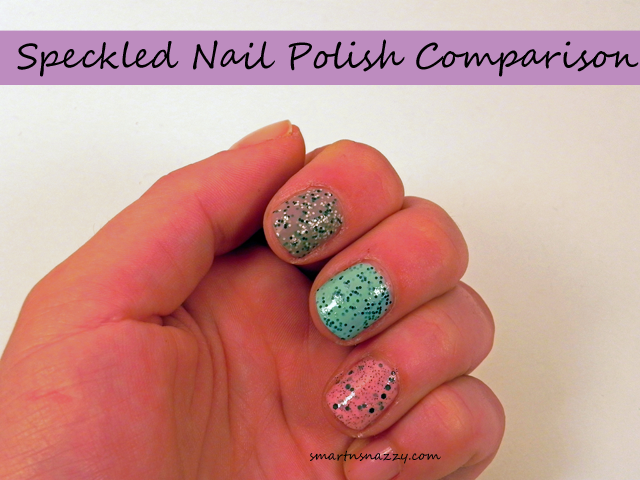 The polish has more depth and a better speckled effect, in my opinion. So how do the three stand up to one another? Well, I've got to admit the Illamasqua is my favorite, followed by the Hard Candy, and lastly the Deborah Lippmann. I don't plan on buying any more DL Staccatos, but I do plan on getting more of the Illamasqua and Hard Candy, for sure! What one do you like best? I still don't know how I feel about these...I did see the hard candy ones at Walmart the other day but passed on them. I'd have to say I like the taupe hard candy one best!